HOPE – Getting to the school bus in the mornings, and meeting children after school at the bus stop is about to become significantly easier and safer for students and parents in the Hope Public School District. HPS Transportation and Facilities Director Maurice Henry and HPS Technology Coordinator Jeff Madlock explained the new “Here Comes the Bus” mobile application and website for Hope Public Schools Board members Monday night. “The student will know and the parent will know when the bus is about to get there,” Madlock said. He said the mobile device application and website offers parents “real time” information regarding the location of their child’s school bus. Henry said the district has been working to implement the system since March. 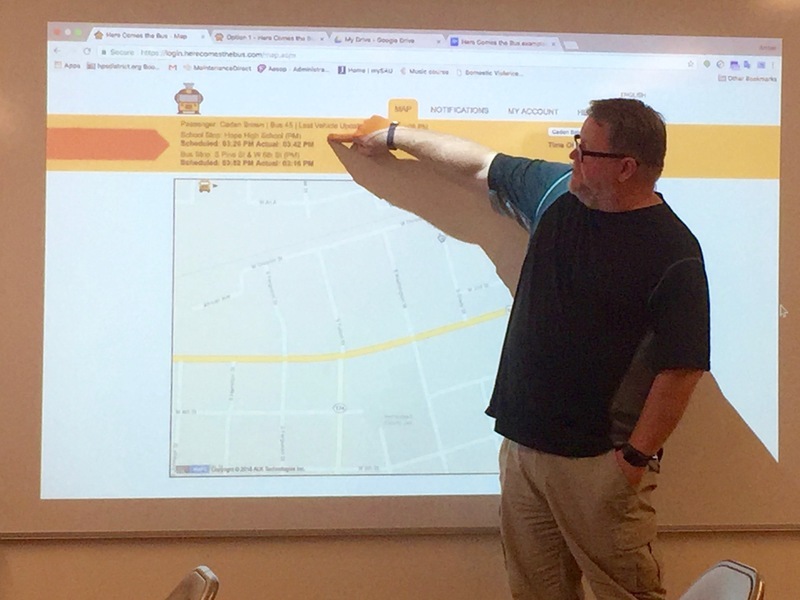 “With it, you will have the information you need to send your children to the bus stop at just the right time, helping to protect them from inclement weather and other roadside dangers,” Henry said in a letter to parents presented to the board Monday night. Both Madlock and Henry noted that the “real time” applications of the new system will have other benefits for the district administration, as well, in providing critical accurate information regarding safety issues that do occur. They pointed out that the system provides information on bus operation as it is driven, including information on speeds, stops and time-stamped data which can be accessed by district administration. “I can know when the doors open on that bus,” Superintendent Bobby Hart explained. The letter will be sent home to parents of Beryl Henry Elementary School and Yerger Middle School students this week, then notifications will be sent to parents of students at Clinton Primary School, Hope Academy of Public Service and Hope High School within about four weeks. The letter explains the concept and how parents can access it on smartphones, electronic tablets or computers. The free software application enables parents to see the location of their child’s bus both before and after school hours; to confirm that the child’s bus has arrived at the bus stop and at school, then back at the bus stop at the end of the day; and, to receive a push notification or email message when their child’s bus is near their stop. The application also provides push or email notification on substitution of buses, and upon delays en route. The software is available in English and Spanish and can be downloaded free from the App Store or Google Play portals. Download the “Here Comes the Bus” application or go to herecomesthebus.com online. Under “My Students,” click “Add;” then, enter your child’s last name and student ID number. Questions regarding “Here Comes the Bus” should be directed to Henry’s office at Maurice.henry@hpsdistrict.org online, or by phone at 870-722-2700, ext. 36; or, Amber Keener at extension 35.